Can Todd Juvinall grow CABPRO (with mudslinging or intelligent dialogue)? On Jan. 2, longtime resident Kim Janousek — whose family also owns B&C Hardware and the Fowler Center — announced: “CABPRO Founder and Nevada County native Todd Juvinall has been named the new Executive Director. Juvinall, a former Nevada County Supervisor, founded CABPRO in 1993. And tea party activist Barry Pruett (whose spouse is a field representative to our Congressman Tom McClintock) is eager to meet-up with Todd: “I will be meeting with Todd next week in connection with some projects,” he wrote on his blog, without elaborating. 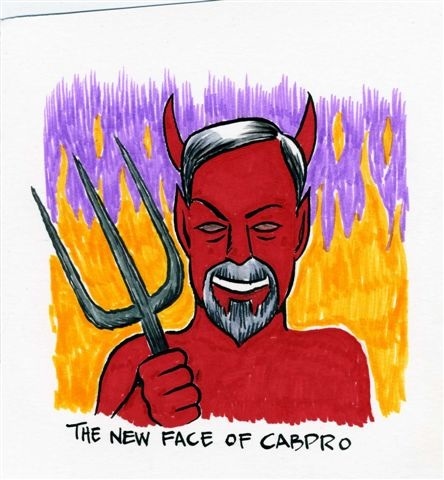 This weekend, Todd announced on CABPRO’s website: “As the new Executive Director at CABPRO, I have assumed the duty of this blog from the Grand Master, Martin Light. Martin did a wonderful job for four years here and I hope to be able to do Martin and the members proud. With our large membership, I hope to expand the organization and grow and grow. In fact, I hear CABPRO isn’t at all as powerful as it once was, and it will be up to Todd to make it “grow and grow,” as it puts it. The money that fueled CABPRO for years — from the construction boom, for example — has all but dried up. But how will CABPRO grow itself? Longtimers are aware of Todd’s style of “debate” (see the cartoon here from R.L. Crabb). His blog, Sierra Dragon’s Breathe (sic), http://sierradragonsbreathe.blogspot.com/ (sic), has been acerbic for the most part, with personal attacks, false innuendo and outright lies. Even extreme right blogger and political ally Russ Steele has warned Todd on his blog: “Most of the time bombast gets ignored. … There will be no need for name calling.” The R.L. Crabb cartoon, which he drew on his own, speaks for itself. What will be Pruett’s role? People will be watching to see whether CABPRO (including Kim and Todd) take a higher-level approach or return to the “mudslinging” days of NH2020, rife with personal attacks. Our community has changed in the past 20 years. Todd has a chance to raise the bar. There’s room for civil debate from a highly conservative voice. But will he? I’m going to keep an open mind, but the community will be watching closely. It will take a massive amount of “good deeds” as an organization to overcome the reputation it now has. God knows it is possible and I hope they do just that. The community, like Jeff, will definitely take to watching to see if there is productive dialog and problem solving. One slip up and the credibility will go up in flames. Didn’t you get your own copy? Excellent question Brad. It would be interesting to see if Juvinal & Co are willing to finally “put up” rather than the insipid rhetoric we’ve unfortunately come to know. Thanks for posting Bob’s cartoon, Jeff. It’s good to see you two can agree on some things. I don’t look forward to having to read about Todd Juvinal’s opinions. I don’t know the man, but from what I gather, he’s not a real mover and shaker in these parts. I mean, what’s he really done? He’s got no discernable game. This county needs producers, not whiners. He’d be better off to sit still and let the grownups handle things. Just to be clear, I posted the cartoon to illustrate how at least one long-timer views Todd. I presume it also will run in The Union, along with Crabb’s other cartoons, including the one about me. After all, Todd is much more of a public figure than a blogger. Let’s all watch for it! If it doesn’t run, it will be yet another example of the publisher’s bias toward the community and its citizens. And come to think of it, B&C Hardware — whose owner is CABPRO’s chairman — is one of The Union’s biggest advertisers. So I suspect this cartoon will never see the light of day in The Union. Funny how that works, eh? A real double standard. Anyway, let’s hope that CABPRO “turns over a new leaf” and raises the level of political debate. Time will tell. Enjoy the “second half” of your weekend! Being childish and calling names is only meant to irritate. Somebody once said, “Sarcasm is the wit of the fools”. It cannot advance any cause. It is the mark of the ineffectual. Mr. Juvinal constantly signals his fears in the form of vitriol. He comes off as neurotic, stricken and weak. If he weren’t so mean, he would have my pity. MOST EVERYTHING CABPRO SPEAKES ABOUT IS RIGHT ON! THE LEFT HAS KVMR SPEWING THEIR NONSENSE HOUR AFTER HOUR AND THE RIGHT HAS A RIGHT TO DO SO TOO. HERE IN THE OUTSKIRTS OF OLD RED DOG WE HAVE A DIFFERENT TAKE…TAKE EVERYTHING WITH A GRAIN OF SALT AND SHOOT AT VARMITS WITH LOTS OF GRAINS OF PEPPER! Thanks JCK. Careful though: Some “lefties” are out there on Red Dog too! Gee, James – I’d figure that you would had used your computer enough to understand that the use of CAPITALS means your screaming, and with the salt and pepper discussion it seems to be the typical modus opperandi that we see on the right wing blogs we see in this county. If you have such a problem with KMVR then most of us WOULD NOT LISTEN TO IT! That is how normal people behave, but that does not seem to be what we see from our wise & just friend. Good luck with finding a station that you can deal with, I’d suggest 830am, as Rush is on there complain about how the conservatives are being screwed…..
I’m curious what CABPRO has on? James, the expression “right on” was one of those old Liberal expressions. You know, the Liberals you seem to abhor so much. I’ve read the CABPRO rag. The words “right on” never came close to how I would describe it. Gee Brad, Who says speaking the truth about life here would cause so much pain. Reality must appear rather foggy to some people on the left. I am a conservative libertarian who sees facts as they are.Your pal in the White House has DOUBLED THE NATIONAL DEBT in THREE YEARS! Yes BUSH has some degree of blame for the mess we are in but not the DEBT. I dont listen to RUSH AND HAVE NOT FOR YEARS. KVMR is great for music and local news. I just dont care for the one sided news take and AS such it gets turned off during newscasts. As far as the salt and pepper thought…well defend yourself with your mouth….ill defend myself with my WINCHESTER! You need a trip to Burning Man. Can I be your guide? Hell Michael, J. C. King, can macho camacho His way on horseback all the way from his fortress to the Playa in less than a week, and try using his Winchester as his pass. A Spaghetti Western in the Clint Eastwood tradition’s just is itching to be a’borning….again. I’m sure the stock from his manhood symbol would be good kindling for the final event blaze. Sorry James on the debt thing, Bush left with $12 trillion and it is now $15 trillion. Bush II doubled the national debt from $5.5 trillion to $12tr but you voted for him anyway I bet. I will not be voting for Obama for the same reasons I didn’t vote for Bush, my civil liberties are too important to me and Obama has continued Bush’s illegal policies and expanded on a few of them. Sorry folks, a little light heartedness leads to your own style of hate speach. I guess this is not the place for libertarian ideas. Check out the national debt clock and use its tools to check the FACTS REGARDING THE DEBT.You can set the clock to jan 2009 and see for yourself. As far as my defending myself with a rifle…that is legal is it not? INSULTING BORN AGAIN CHRISTIANS is fun huh? BURNING MAN? That is really a great way to waste time and damage the deserts eco system. Liberals always blame everybody else for problems they cause. This whole left and right thing is killing our country. I was supportive of the PRESIDENT till he started bad mouthing AMERICA. Some people on this blog need to get a life and not hate other people with differing views. I have lots of friends on both sides of the political spectrum who can understand a need to try and solve the mess we are in. IVE SAID MY PIECE HERE. TRIED TO MAKE PEACE AND ILL MOVE ON. Nice work Jeff, too bad your viewers cant have a sense of humor and communicate at the same time. “Hate speech?” You woke up on the wrong side of the bed. Tone it down, or take it elsewhere. Thanks, and have a great week. If you look at the national debt through the last budget (2009) George W Bush signed the national debt was $11.8 trillion. That budget had a 10% increase and it wasn’t vetoed despite the democrats not having the votes to override the veto. Don’t get me wrong I am not defending the democratic party but I want the bs that Obama has doubled the national debt to stop. There are plenty of reasons not to like the Obama administration and there is no need to lie. He supports the Patriot Act, invaded sovereign nations without a declaration of war from congress, suspended habeas corpus, assassinated US citizens, signed NDAA, has given free reign to companies like Monsanto and left the USDA to the controls of big agriculture, which has become very oppressive to small family farmers. This is a few but there are so many more. Stick with the truth and I hope the opposition would decline. Well said, up until ‘invaded sovereign nations without a declaration of war from congress, suspended habeas corpus, assassinated US citizens’ … which I see as just more hype. He acts as commander-in-chief and I still see Libya as being a threat at that point. Habeas Corpus was blown long before in the name of defense. And what about ‘assassinating US citizens’?!? If you’re talking about insurgent combatants, that again is a threat he is assigned to eliminate. I think he underestimated the job, as most of us with yard signs even knew. The machine is much larger than an individual; so I do realize at the same time we ascribe success, we must assign blame – which is a product of that larger manufacture; thus I do not think Obama has done anything unexpected. I do believe he has soul, and given the mandate of what I see as the next election, hope that he will instill into the discourse his personal beliefs. Apathy has, and will continue to, rot at the core of the ‘right’, as was the case after Newt’s attempts to pull down Clinton, and we shall see if there is enough juice left to effect real change in terms of oversight, etc. that I think we all see as needed. The saddest commentary is that that questions his motives. I still believe Barry to be the most earnest, genuine, intelligent, and trustworthy of candidates. I will extend his contract given the alternatives (including your Ross Perot-light Ron Paul). I wouldn’t argue much with what you have written. The inherited Constitutional violations and War Powers Act aren’t Obama’s doing but his admin has the opportunity to draw down the scope and powers of the executive branch. I believe that was one of the biggest motivators for many who like myself voted for him in 08′. We are thoroughly disappointed in his administration and the direction it has taken when it comes to executive power and civil liberties. I am a big fan of due process no matter what the circumstances. I know that if a had a loved one killed my opinion would be different but it is at this point due process is at its most important. I had a sign last year in the 4th of July Parade that read something like US Constitution in good times and especially in the bad times. yeah Ben, we’re probably not that far apart. And I readily admit that I may be overly protective my choice for candidate, as the options just seem frightening. I guess I went through ‘lesser of evils’ to somewhat of a battered enabler… “he told me he’d change, and it’ll be different this time”… we’ll see. James, I was enjoying a good read and comments here upon which I came across your first comment. This registered Libertarian read quite a bit of venom spewed forth from your comment. You do have as much right as anyone else to your opinion but I feel you would have had a nicer response had you been nice to begin with. Hate speech or clown speech? I don’t really se anything here that I would qualify as “hate speech”, other than perhaps the vague position that we have a second amendment option to defend our rights at the point of a gun, without a clear understanding or articulation of what those rights and concomitant responsibilities are, although I would agree that that is fundamental to American identity. One of my frustrations is that those rights are often inadequately articulated. When James speaks of ‘rights’ being infringed upon, I do not have a clear idea what specific rights, and in what format, he see’s them being infringed. The devil is always in the details. The reality is that the United States is a nation founded on a balance of rights, responsibilities and interests that are often in conflict. Our constitution itself was a grand compromise that required articulation of those rights to be adopted. The beauty of our system is that we have always found a way to balance them, and allow for the ingenuity of our people to progress within that framework. I personally think that facilitating dialogue between the libertarian and the ‘left’, for want of a better description, is highly valuable. I suspect that they would find they have quite a bit in common. I think most of us here would agree that Democrats and Republicans are both responsible for debt. But I’m not sure all of us would agree that debt is our most important problem, nor the first one that needs to be tackled. The deterioration of the dialogue is the threat to those rights that I am most concerned about these days. No rights exist without a framework to balance competing interests and resolve conflict. HI Steve! there is some thought out there that the Death of nations can be caused by its huge debt. I have read that once a nations national debt reaches 200% of its yearly gross national product it never can pay it back and recover. Ours is reaching 100%. Nazi Germany was built on currency problems from its WW1 debt and other problems, it led the world down a terrible road that started with currency. I think we should really consider a national sales tax and balanced budget amemdment…otherwize this endless wasteful spending will NEVER END. varmits are generally considered to be small animals, killable with a 22. Most of them do no engage in debates in the Blogosphere. Therefore I would consider this a pretty direct threat, admittedly a stupid one. JC Clark of Golden Colorado perhaps is this man. I’ve seen the type many times in The Union, before it was censored using a a nanny state watchgroup. They come in from out of town, prancing and dancing, and then they go away, usually for good, convinced they’ve somehow changed the world. Could also be connected to Robert Clark locally. If you shoot a varmit with a real 30-06 WINCHESTER (the only reason I could see for capitalizing the name, other than the manhood issues) you’d be wasting a buck a round these days. Besides, pepper and salt can only be fired from a shotgun, and like our writer here, they haven’t got much range. No this man is not vaguely threatening, he’s really into it, as a full time pastime, now that his viagra script has expired. The Viagra comment is a little below the belt, so to speak. You’ve got the chops, can we see more of the “sweet science” in your comments, please? Okie doki, I figured I try drawing his fire (staying within his metaphors a little longer) so that the you could see more of what he’s made of. I think he’s coming around. based on his 10:24 post, and I shall cease and desist for now. Thanks Steve. I was just making a little fun of the CABPRO article and how the left hates their views. Alot of what CABPRO writes about is formed around proven facts of history and life here on this planet. Other things are just their particular view that is just that…their view. The labor unions of the early and mid 1900s were mainly responsible for American dominance in the fields they were key in. auto ,steel ect. Giving people a decent wage and a safe environment Today they are causing distress in showing class warfare. Demanding no room to compromise in forming their positions. Small business and self employed people cannot relate to these unionized people. The situation showcased in Wisconsin was a particularly bad one for non unionized people looking into the situation. Whining about a very small cut in pay when everyone in the country,most everyone is hurting. There are too many different views on what is right and wrong in this country. Most of us would agree that alot of the problem we face in WASHINGTON D.C is that the powers that be.Those that thrive on that power. In turn being twisted this way or that way by the lobbiests on both sides looking for more influence. People can call me names and it really does not bother me. It is their own insecurity that shows. In 1976 i was in HIGH SCHOOL in southern cal when a local congressman by the name of BARRY GOLDWATER jr. showed up to speak about current events. When asking him a very difficult question for him to answer in front of two thousand fellow classmates….He just stood their and looked foolish. The question was about a defense program that was really important to his district…and he could not answer it….i was told to shut up and sit down and being a loser from a teacher i never had. I have never shut up since…SORRY! America needs a PRESIDENT that she can honestly support. One that does not just run around and make us feel bad about ourselves. I believe in AMERICA and think that she will survive. Have term limits and make politicians not be able to work for the same people they dealt with while in office. The same with military officers. Have AMERICA leave Japan, Europe and Asia. The money spent by the defense department to prop up the local economy oversees could be better spent rebuilding a crumbling infrastructure and so on. Yes Virginia….there is a SANTA CLAUSE….Its the UNITED STATES GOVERNMENT! I sense a loooon sloooow pitch, and very soon, Ron Paul is going to connect. Sorry Doug, that response was meant for another comment — got the nesting wrong. That’s some liberal self-reliance. Think about it. Excellent response Gail. Self-reliance and personal responsibility. I posted it above, but got my nesting wrong, so here it is where I wanted it. James, Better said and presented. Well how about the totally obstructionist House Republicans, completely freaking out over ANY increase in taxes, and more accurately, actually just the end of a tax CUT that had been PROMISED to go away after ten years of bulking up the uberrich. The small cut in pay was preceded with pay cuts, benefit cuts, and so on. The cuts have been going on for a long time and the unions finally said that is enough. John Cleese checks in on extremism and bad, rude behavior. We need to send the “men in white suits” after Todd’s blog. He and his anonymous friends think I am posting there. I am not. Can’t a blog administrator tell who is posting on his own blog? Or moderate the comments? This sounds like Alice in Wonderland. The publisher thought I was making this all up until I sent her the URL. I am really writing a book called “The State of Jefferson,” largely based on this blog and the local blogosphere. Now Todd is joking about his “book.” I hear the title is “You can’t fix stupide (sic)”! (As in “SierraDragonsBreathe”) LOL. Todd is without a doubt one of the most transparent partisans I have ever dealt. Zero insight on how the effects of the political world works since his whole sphere of existence is based on what ever the Republican Party says. That on top of being nasty human being, at least on blogs and social media. I cannot imagine someone being that way in real life in a small community. If he is it must be a very lonely existence. I don’t wish Todd any harm and only pray for him to actually see the light one day and to come out of the darkness. Todd’s blog attracts a lot of dips: a real “Rogue’s Gallery” of our community. Bottomofthebarrel.com. Ha! Looking at Sierra Dragon’s Breathe [sic] I noticed someone is using anonymous cover to take on the big buffoon on for being a complete hypocrite about his personal life (not to mention continuing the circle of stupid meme). Could not happen to a more deserving local blowhard. And the dumbling think’s it’s me! I haven’t commented on his blog in ages. I’ve never commented on his blog although he’s made a fannie of himself accusing me. EWWWW! I would have to sterilize my fingers & keyboard if I did so. I’d would have to do the same receiving anything from the effeminate TRULY FUE FUE. Small towns are a hoot! Personal ridiculing and bullying me will not force me to stop writing about The Union. The latest reports indicate that is shifting its printing to Sacramento (for the first time in 150 years) and “outsourcing” jobs. Yikes. I often see the name “Barry Pruett” appearing on Todd’s blog in one form or another. An aspiring (albeit unqualified) politician, Barry lost his only race here in every precinct. Must have been humiliating. Nobody can remember when anybody lost so decisively. The people spoke, but Barry can’t let it go. He should. Along with hard-right activist and local attorney Barry Pruett, “Fish” (AKA David Larsen of Carmichael) also is one of the few “regulars” on Todd’s blog. “Birds of a political feather fly together.” “Fish” was fired from the other blogs, having been chastised by Rebane and others for his lack of style and substance, but Todd’s cesspool of commentary is the “last stand” for him. He has no other rock to crawl under and throw rocks. In the real world, Dave Larsen is a hard-right political ideologue who lives and works in Carmichael, near Sacramento, yet Todd continues to allow “fish” to comment on our community issues — hurling baseless personal attacks under the cloak of anonymity. I will be interviewing David Larson (or at least seek an interview) in my political book “The State of Jefferson.” David represents what political activism has become in our region, not just our nation, with the wacko hard right. You can’t make this stuff up. Russ edited the post to remove the loaded word — a good call. Dave Larson, who lives and works in Carmichael, can’t hide behind “fish” in the real world. Neither can Todd Juvinall or Barry Pruett. All of them will be held accountable for their commentary. Duh.